Jim McCorry has resigned as Down team manager with immediate effect after just one season in charge. The Armagh native led the county to promotion to Division One in the spring but they lost both championship games to Derry and Wexford. He narrowly won the backing of Down officials to stay in charge on a 22-20 vote in July but has now stepped down. In a statement on Thursday, Down said they met McCorry on Monday to "reassure him he had 100 per cent support". Down were edged out by a point by Derry in the Ulster Championship and then crashed to a 2-16 to 2-11 defeat in the All-Ireland SFC qualifiers by Wexford, who had suffered relegation to Division Four in the spring. After winning a narrow vote to continue as team manager, McCorry held further discussions with the county board and rumours persisted about whether he would remain in charge. Members of the Down executive committee met this week with McCorry, who led Kilcoo to three Down SFC titles in four years prior to taking over as county manager, "to reassure him that he had 100 per cent support from both the executive committee and the clubs in Down". "And that Down GAA would not be found wanting in their support for Jim and the Down Senior Footballers in 2016 and beyond." On Thursday night, Down thanked McCorry and his backroom team for their "endeavours" and wished him well in the future. When contacted by BBC Sport NI on Thursday night, McCorry declined to comment on his decision. 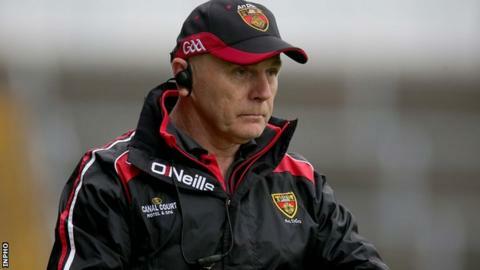 The players are understood to have wanted him to remain in charge and midfielder Caolan Mooney criticised elements within the county who failed to back him. "Some people in the county are watching too much soccer. Not backing him (McCorry) after 1 [one] year is disgraceful in my opinion," he said.